Looking at the windows this morning and seeing the sun shine passing thru, it was like a new start to me. There were not worries about T21, it was a day that we enjoyed each other as a family. A lot of laughs, shopping, walking and eating. How much things has changed since Tommy began to win his battle against the sensory issues. We are all enjoy his progress and celebrating any of his small or big accomplishment. I truly feel a relief in my heart. We enjoy seeing Francis growing up so fast and showing us how smart and independent he is for being a 11-month old baby. 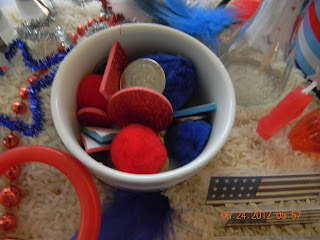 Our day was very patriotic because we had a lot patriotic activities to get ready for the 4 of July. I created a sensory box on Saturday night based on the 4 of July theme. 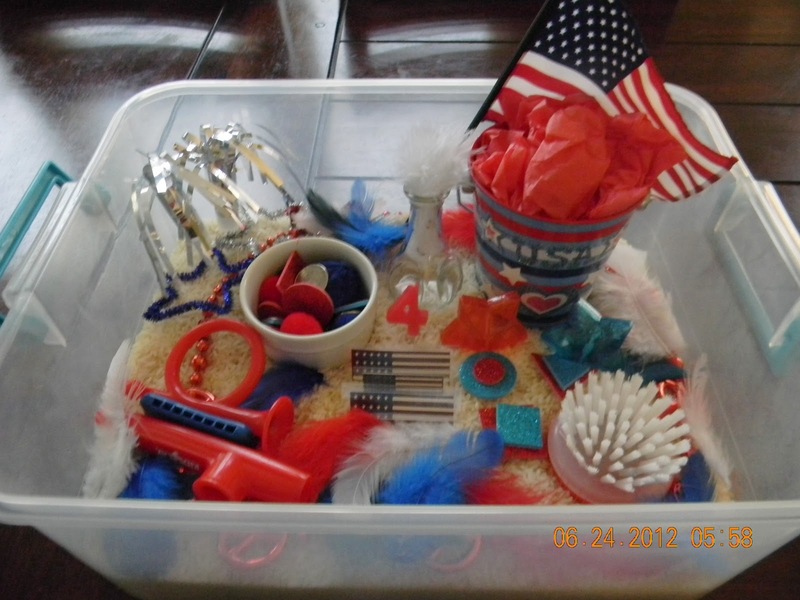 As a fun way to work on tactile sensory processing. 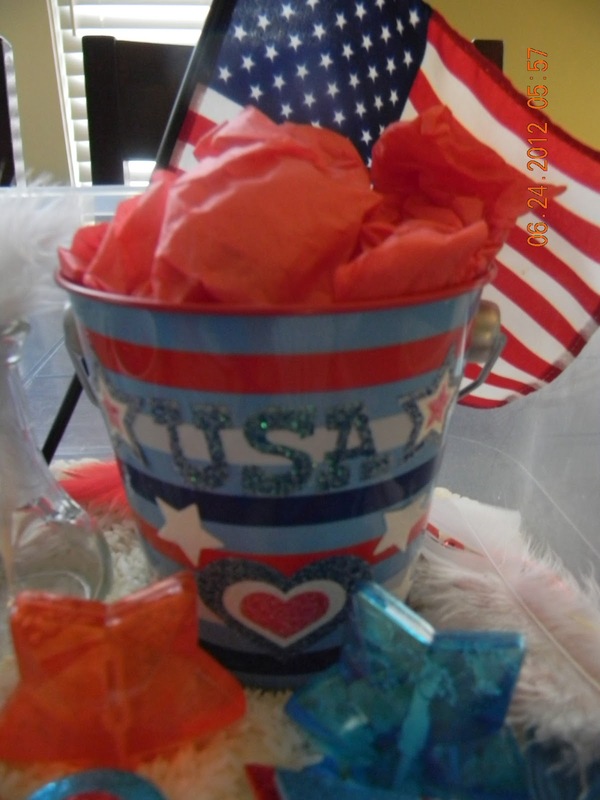 We also song 'God Bless America' several times during the day. We played keeping a white balloon up —Tommy is getting really good on this, followed by his little brother. Tommy got annoyed when Francis interfered trying to get the balloon. The white ballon it is because the colors of the American flag. 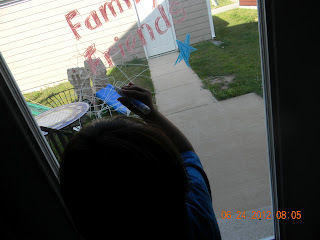 We read the book 'F is for Flag' that talks about the American flag, and we also did some coloring on the back door. 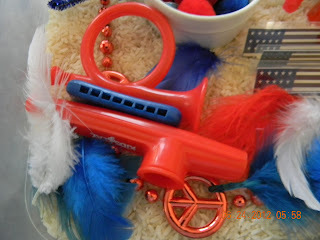 I did a lot of therapy time while doing this activities, but it was so much fun that I didn't think of therapy. The color for today was white. We decided to go to a shopping center, which is about 30 minutes away, to check on some shoes because Tommy's snicker look warm out and Francis didn't have shoes. The babies shoes from Tommy don't fit him anymore. I found some Tommy's old shoes but they look too warmed out. So we went to the store we can get the brand Pediped. When we got there, we were very excited to get a nice pair of shoes for the boys. While in this store, we got Francis' shoes size and the lady told us Francis was ready for more sturdy shoes than the ones I was thinking of. But they didn't have the colors we like, so we didn't get the shoes. So we left and visited other stores. We ended in the Nike store. My husband went to the kids section and he got in love with some shoes for the boys. But the best of all, the boys got in love with the shoes, too. Tommy got very excited when he tried them on. It was so cute how he showed his excitement. He began to walked on tip-toes and suddling he began to jump with a big bright smile —He was just making sure the shoes were resistant to him. So we knew! He liked the shoes. Meanwhile, we were trying to get the right size for Francis. I thought the shoes were not developmental accepted for me because he is still a baby and he needs a softer sole, well we put the shoes on him and it was just like the magic shoes. He walked realy good with the shoes and because of the grip on the rubber sole, he wasn't falling. He even was very speedy walking on those shoes. So I checked them to see if they will pass my createria about apporpate shoes for the boys. They have rubber sole, they bend easily, there is enough room around the feet so the shoes are not too tide, and the back of the heel is sturdy. So the shoes met the criteria, but the best of all, they were on sale. Both boys left the store waring their new pair of shoes with a big wide smile. We went to eat lunch to one of our favorite restaurants. The best of all, they sale gluten free and organic meals. Tommy was so hungry that he didn't wait for us and went to pick a table and sat to wait for his food. Francis was exploring around the restaurant and showing off his new shoes —well, he was getting used to the idea of wearing shoes. While we were eating, he didn't want to be fed, so we let him to eat by himself. Here is Tommy eating his meal. A lot of veggies with brown rice and ginger sauce. 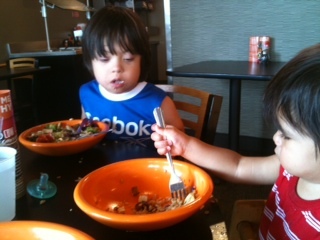 Here is Francis trying to eat with a fork. But it didn't work out as he was expecting. When we came back the boys took a nap, while I worked in the garden for about 45 minutes. It was too hot, but I could get some work done in the garden. Today was a beautiful sunny day, but a little hot. Regardless the heat, we enjoyed our Sunday.